A vampire is a mythological creature that has pale skin, their skin is sensitive to sunlight, they have prominent canine teaath and their have a bad reaction to garlic. Mommy my skin hurts, i bit my lip and that garlic bread made me sick! Okay we'll take you to the doctor! After examining your blood, we have determined you have Porphyria! ALL OF YOUR BLOOD BELONGS TO ME! Mayor we have to do something about this "vampwoman" she's going to eat everyone! What are your concerns citizen? 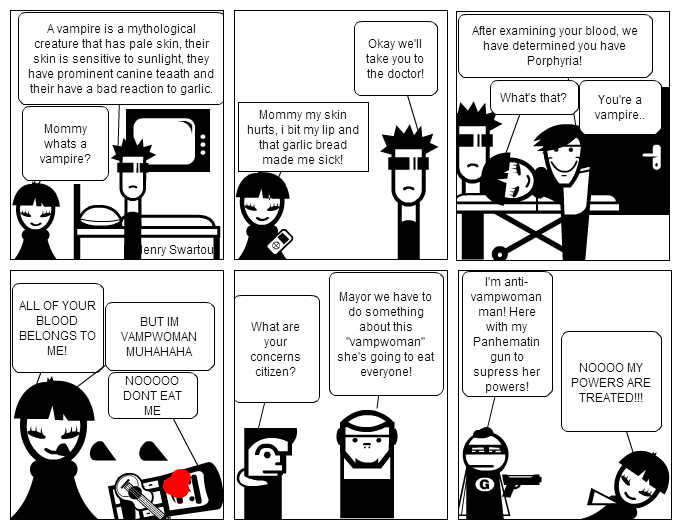 I'm anti-vampwoman man! Here with my Panhematin gun to supress her powers! NOOOO MY POWERS ARE TREATED!! !